1.1. The causes of earthquakes in the area of New York. 2.2. Largest Earthquake in New York (September 05, 1944). 3. Seismicity and Seismic Hazards. 6. The Eastern North America Rift Basins. Most of North America east of the Rocky Mountains has infrequent earthquakes. The region from the Rockies to the Atlantic can go years without an earthquake large enough to be felt, and several U.S. states have never reported a damaging earthquake. The earthquakes that do occur strike anywhere at irregular intervals. So New Yorkers were shocked by the earthquake that occurred August 23, 2011 (Magnitude 2.2, 10:35:17 UTC, 42.69N, 74.10W). This page contains information showing the origin of earthquakes in seismically inactive zone, within which is located in New York. The last Earthquake in the New York Region you could see if click here. The causes of earthquakes in the area of New York. The NYC area is far from the boundaries of the North American plate, which are in the center of the Atlantic Ocean, in the Caribbean Sea, and along the west coast of North America. 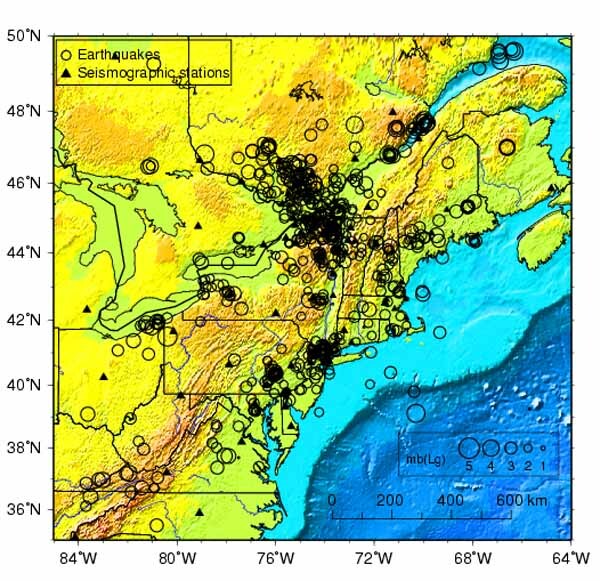 The seismicity of the northeastern U.S. is generally considered to be due to ancient zones of weakness that are being reactivated in the present-day stress field. In this model, pre-existing faults that were formed during ancient geological episodes, persist in the intraplate crust, and the earthquakes occur when the present-day stress is released along these zones of weakness. The stress that causes the earthquakes is generally considered to be derived from present-day rifting at the Mid-Atlantic ridge. 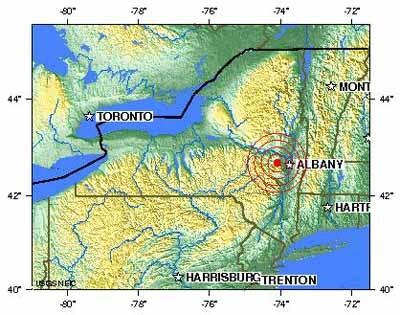 Strong earthquakes in 1638, 1661, 1663, and 1732 in the St. Lawrence Valley and a shock near Newbury, Massachusetts, in 1727 were felt in New York before the first notable tremor centered within the State was recorded. On August 10, 1884, an earthquake (near New York City, New York, 19:07 UTC M 5.5) caused large cracks in walls at Amityville and Jamaica (intensity VII). The shock was felt strongly at New York City. In addition, 30 towns from Hartford, Connecticut, to West Chester, Pennsylvania, reported fallen bricks and cracked plaster. The total felt area was estimated at 181,000 square kilometers. This severe earthquake affected an area roughly extending along the Atlantic Coast from southern Maine to central Virginia and westward to Cleveland, Ohio. Chimneys were knocked down and walls were cracked in several States, including Connecticut, New Jersey, New York, and Pennsylvania. Many towns from Hartford, Connecticut, to West Chester, Pennsylvania. This earthquake also was reported felt in Vermont, Virginia, and Washington, D.C. Several slight aftershocks were reported on August 11. 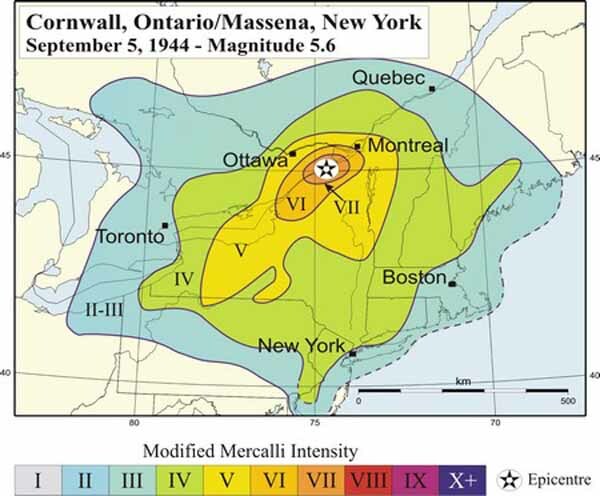 An earthquake centered about midway between Massena, New York, and Cornwall, Ontario, Canada, caused an estimated $2,000,000 damage in the two cities. The shock destroyed or damaged about 90 percent of the chimneys at Massena (intensity VIII), with similar effects at Cornwall. In addition, masonry, plumbing, and house foundations were damaged at Massena. Isoseismal Map September 05, 1944 Earthquake.. Many structures were rendered unsage for occupancy until repaired. Press reports indicated a large number of wells in St. Lawrence County went dry, causing acute hardship. Brick masonry and concrete structures were damaged at Hogansburg; some ground cracking was also noted at nearby towns. This earthquake was felt over approximately 450,000 square kilometers in the United States, including all the New England States, Delaware, Maryland, New Jersey, Pennsylvania, and portions of Michigan and Ohio. A few points in Illinois, Indiana, Virginia, West Virginia, and Wisconsin also reported feeling the tremor. Earthquake rates in the northeastern U.S. are 100 times lower than in California, but the earthquakes that do occur in the northeastern U.S. are typically felt over a much broader region than earthquakes of the same magnitude in the western U.S. This means the area of damage from an earthquake in the northeastern U.S. could be larger than the area of damage caused by an earthquake of the same magnitude in the western U.S. The cooler rocks in the northeastern U.S. contribute to the seismic energy propagating as much as ten times further than in the warmer rocks of California. A magnitude 4.0 eastern U.S. earthquake typically can be felt as far as 100 km from its epicenter, but it infrequently causes damage near its source. A magnitude 5.5 eastern U.S. earthquake, although uncommon, can be felt as far as 500 km from its epicenter, and can cause damage as far away as 40 km from its epicenter. Seismicity of New York. (1990 – 2003). Earthquakes recorded by (LCSN: Lamont-Doherty Cooperative Seismographic Network). 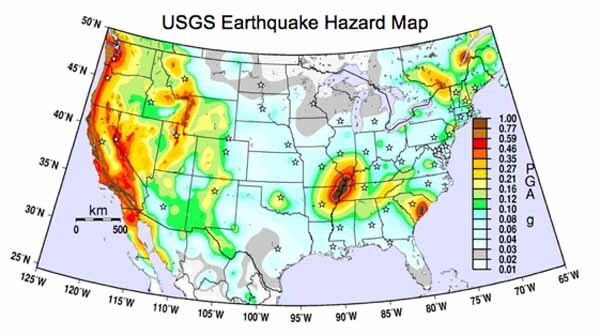 National Seismic Hazard Map developed by the U.S. Geological Survey in 2008. This map shows contours of the percentage of the force of gravity that is predicted to have a 2% chance of being exceeded in 50 years. To appreciate why these values of ground shaking are expressed as a percentage of the force of gravity, note that it requires more than 100% of the force of gravity to throw objects up in the air. In terms of felt effects and damage, ground motion at the level of several percent of gravity corresponds to the approximate threshold of damage to buildings and houses (an earthquake intensity of approximately V). For comparison, reports of "dishes, windows and doors disturbed" corresponds to an intensity of about IV, or about 2% of gravity. Reports of "some chimneys broken" corresponds to an intensity of about VII, or about 20% to 30% of gravity. 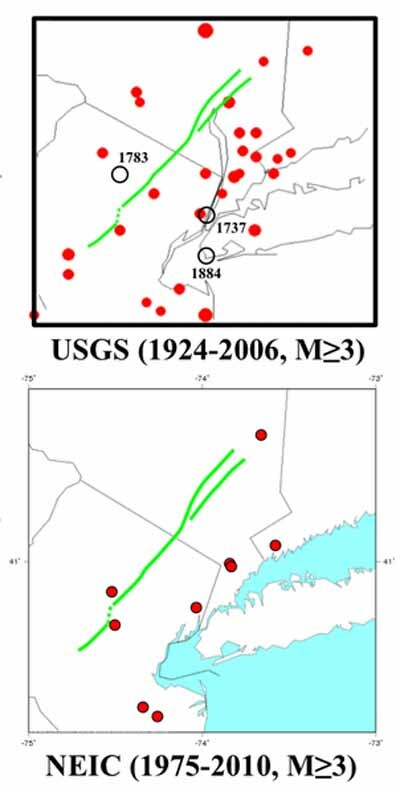 Seismicity Earthquakes, including damaging historic events with magnitudes as high as mb = 5.2, occur throughout the lower Hudson region in southern New York and northern New Jersey. For example, notable earthquakes in the region around Peekskill include: June 7, 1974, Wappingers Falls sequence (mb(Lg)=3.3); January 17, 1980, Annsville, near Peekskill, New York (mb(Lg)=2.9). Earthquake epicenters in the region, although scattered, generally follow a southwest-to-northeast trend from eastern Pennsylvania, through New Jersey, and into the Hudson Highlands in Rockland, Westchester and Putnam Counties. Although the epicenters are scattered, the seismicity patterns appear to be concentrated along several geologic features, including the Ramapo Fault System. The Ramapo Fault zone, spanning more than 300 kilometers in New York, New Jersey, and Pennsylvania, is a system of faults between the northern Appalachian Mountains and Piedmont areas to the east. This fault is perhaps the best known fault zone in the Mid-Atlantic region, and some small earthquakes have been known to occur in its vicinity. The Ramapo Fault forms the boundary between the Newark Basin and the Highlands, running from Haverstraw, New York to near Schaefferstown, Pennsylvania. The Ramapo Fault has been blamed for several past earthquakes, but the specific association of any significant earthquake with this fault has yet to be demonstrated. A damaging earthquake affecting New York City in 1884 was incorrectly argued to be caused by the Ramapo fault, likely because it is the most prominent mapped fault in the greater New York City area. At the present, the relationship between faults and earthquakes in the New York City area is understood to be more complex than any simple association of a specific earthquake with a specific fault. 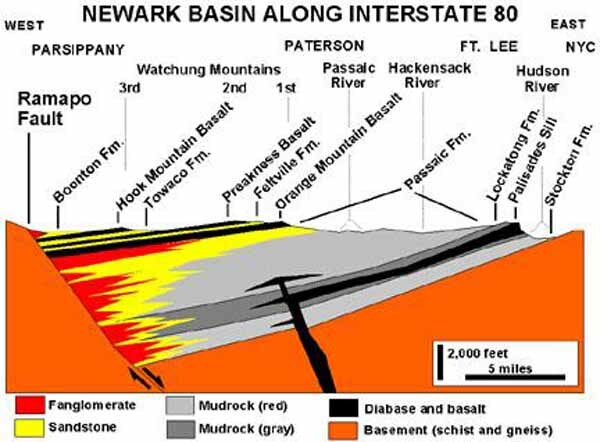 The Newark Basin is a sediment-filled rift basin located mainly in northern New Jersey but also stretching into south-eastern Pennsylvania and southern New York. It is part of the system of Eastern North America Rift Basins. Approximately 220 million years ago, during the late Triassic Period, the supercontinent Pangaea began to break apart. The focus of the rifting began somewhere between where present-day eastern North America and north-western Africa were joined. The Ramapo Fault forms the western boundary of the Newark Basin. It is the surface location of the fault between basement blocks of Precambrian bedrock shown in orange. A USGS cartoon showing the break-up of Pangaea and the origin of the Newark Basin. USGS cross-section of the Newark Basin. The Eastern North America Rift Basins are a series of sediment-filled depressions created by large-scale continental extension. 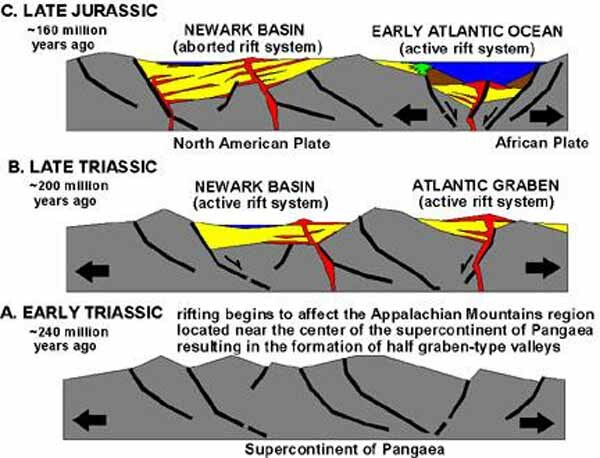 The Eastern North America Rift Basins include follow rift basins: 1.Wadesboro, 2. Sanford, 3. Durham, 4. Davie County, 5. Dan River and Danville, 6. Scottsburg, 7. Basins north of Scottsburg, 8. Farmville, 9. Richmond, 10. Taylorsville, 11. Scottsville, 12. Barboursville, 13. Culpeper, 14. Gettysburg, 15. Newark, 16. Pomperaug, 17. Hartford, 18. Deerfield, 19. Fundy or Minas, 20. Chedabucto. The Eastern North America Rift Basins (1.Wadesboro, 2. Sanford, 3. Durham, 4. Davie County, 5. Dan River and Danville, 6. Scottsburg, 7. Basins north of Scottsburg, 8. Farmville, 9. Richmond, 10. Taylorsville, 11. Scottsville, 12. Barboursville, 13. Culpeper, 14. Gettysburg, 15. Newark, 16. Pomperaug, 17. Hartford, 18. Deerfield, 19. Fundy or Minas, 20. Chedabucto). 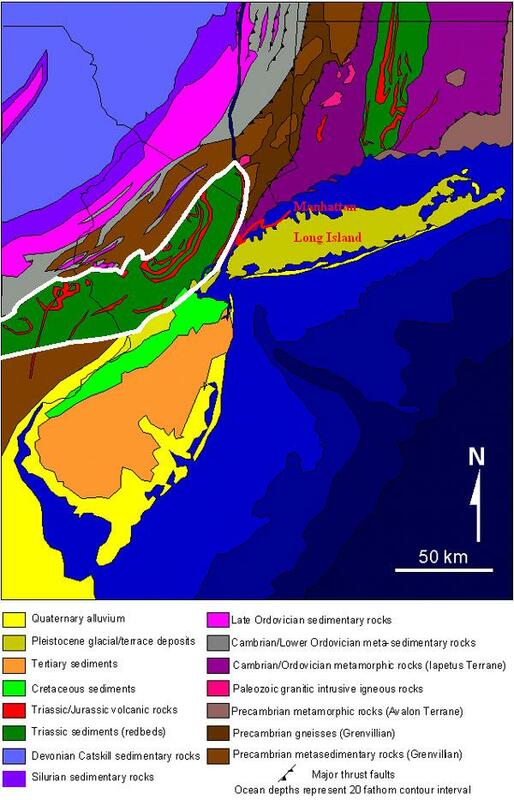 The basins are characterized by west- to northwest-dipping strata in the southern rifts (North Carolina to New York) while the northern ones (Connecticut to Nova Scotia) tend to dip northward. - Earthquake in New York Region ( USGS National Information Center). - Lamont-Doherty Cooperative Seismographic Network .